We have just returned from an incredible three weeks in Singapore, where unlike many others who visit the country we spent the whole time in nature parks, forests and gardens observing birds. The only shopping we did was to buy fresh fruit and some Asian snacks for while we were out all day hiking and birding. Most people in Singapore were photographing birds, so we did rather stand out as we walked for hours each day wearing binoculars and carrying a small camera! We were there to observe birds rather than photograph them. The weather was hot and humid just like Broome at this time of year and so we did not find it unbearable and just carried a lot of water with us each day. There are water coolers in many places and water from toilet facilities is safe to drink unless it states otherwise. We travelled to Singapore from Broome overnight on 5th March arriving in the early morning of the 6th March. Our flight took us two and a half hours south to Perth to then fly north about five hours to Singapore. As is often the case it is cheaper to fly overseas than domestically and as such our return flights to Singapore were half the price of flying to Sydney return. Arriving in Singapore we soon collected our bags and got ourselves a NETS card for travel on public transport and to also use in supermarkets. Due to the fact it was not yet 07:45am it was a S$1.09 trip to our hotel near the Singapore Stadium and they kindly offered a complimentary early check in. There were many good hotels in that area that have been renovated recently and conveniently located between the East/West line and the Circular Line and costing about S$75 per night. The train system is fast and efficient and was our primary mode of transport. If the train did not go all of the way then we took a connecting bus or walked. We dropped our bags and got changed and hopped back on the train to go to the end of the line at Pasir Ris. We were met by several Cattle Egret in beautiful breeding plumage feeding on the grass right next to the train station. We could only walk until about 1pm and we were too exhausted to bird any longer. We had found thirty four bird species so far in Singapore and had to admit defeat due to lack of sleep and returned to the hotel. Thankfully there are many cheap eats around the Kallang area and most meals during our stay in Singapore averaged S$2.50 – S$6. I will now skip forward to Thursday, 14th March. 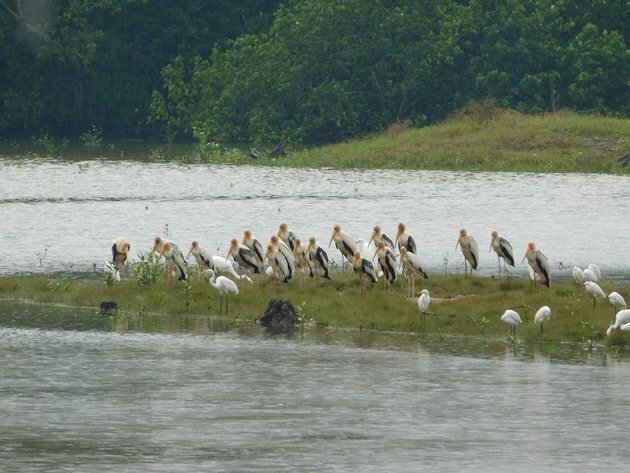 We had been busying bird watching all over Singapore and had reached 112 bird species and had decided it was time to visit Sungei Buloh Wetland Reserve. It may appear odd that this location had not been high on our list as a place to visit early on during our trip. However, due to the fact that we live in Broome and are surrounded by shorebirds that number in their thousands, we had chosen to look for completely new birds. We took the train from Kallang to Kranji before 07:45am and it took about an hour to get that far for S$1:43. Transferring immediately to the 925 bus to get to the new entrance of the Sungei Buloh Wetland Reserve was an additional 5 cents! We had arrived at 09:15am. We had arrived at low tide and there were many Egrets including our first Great Egrets for Singapore feeding on the mud. 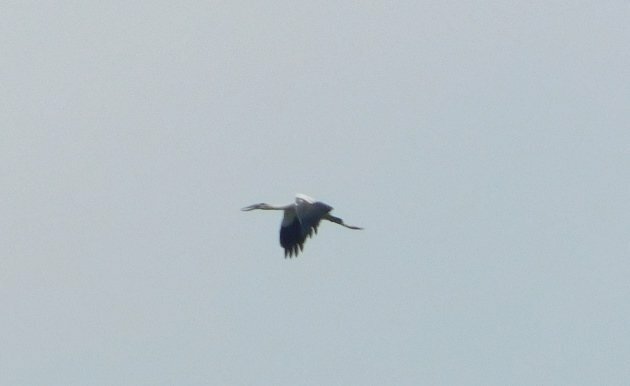 There was also a lone Milky Stork and Great-billed Heron as we walked towards the old visitor centre. There were a couple of people with large cameras and then several school groups. The children appeared to be mostly interested in seeing the crocodiles! As we walked the path through the mangroves it was a depressing sight. There was every sort of plastic, Styrofoam and other rubbish just lying among the vegetation. We hoped the children would see the awful situation of what happens when you don’t dispose of your rubbish properly and hopefully in the future there can be something done to remove it. Other areas of Singapore had not had this level of rubbish, but with the tidal movements in the Johore Strait it appeared much of it ended up her from both Singapore and Malaysia. The tide gradually came in and we were alone in the reserve as we walked all of the trails and watched and waited. On the boardwalk we came across a very vocal Copper-throated Sunbird. We observed Common Redshanks, Common Sandpipers and the crocodiles at the main bridge. We had observed thirty six species of bird by the time we made it around to the tower overlooking the ponds that were gradually filling up as the tide came in. Pacific Golden Plovers and Whimbrel soon arrived in the ponds to roost and we observed many locally marked birds. We also noticed three Whimbrel carrying satellite trackers on their backs and are awaiting information from the bander. From the tower we had excellent views all around of most of the ponds and also a good proportion of the sky, because you are just above the tree line. It was a good location to observe Brahminy Kites, White-bellied Sea Eagles, Grey-headed Fish Eagles, Oriental Pied Hornbills and Dollarbirds. All of a sudden a new bird was flying across the sky and we soon both had our binoculars on it. There was something “not right” about it. It was not a Milky Stork or a Painted Stork. Grant told me to point the camera at it and hope it could find it and capture some sort of image, which I promptly did before it was out of vision behind the tree line. It was 13:52 and we were alone in that area of the reserve. From the camera we still could not quite work out what we had photographed, but Asian Openbill came to mind. We stayed at the reserve until 16:15 and then took the bus and train back to the hotel. Downloading the photos to a computer we realised we did in fact have a photo of an Asian Openbill. Looking online we discovered there was one previous record for Singapore in January 2013. Due to the fact that we don’t have a Facebook account we could not let others know via that platform and decided to email the rarity to the Nature Society of Singapore. It was 20:17 and the immediate response was that due to the nature of their work it could be three to five days before we got a reply. However, at 07:33am on March 15th we received a reply and they were asking to see the photo. The one and only photo was sent through and that was the first distant sighting of the second record of an Asian Openbill in Singapore. The “heavily cropped” one and only photo I took! Subsequently there was another sighting of the Asian Openbill on the ground at Sungei Buloh Wetland Reserve on March 17th and word soon got out on many social media platforms and a “twitch” was on! We only needed to check the public Facebook website for the Nature Society of Singapore to see it was best we now avoided the crowds at Sungei Buloh Nature Reserve! It actually meant we could bird almost anywhere else in Singapore and not come across any photographers at all, because they were all trying to photograph the Asian Openbill! It was being reliably observed early morning and late afternoon around the main bridge and many people got excellent photos and videos of the Asian Openbill. You could see the size comparison of it among the egrets and other storks. It had become quite a celebrity! We were flying back to Broome overnight on 26th/27th March and because we had only got the one photo of the Asian Openbill we thought we should try for another if we could on Monday 25th March. It did not matter too much to us if we did or did not see it, because there were other birds to observe and we may find something we had not seen yet anyway! We had already observed 164 bird species in Singapore and the next new bird was one that we had heard, but not seen. The Golden-bellied Gerygone was calling at the first boardwalk at 08:30am and we found it! We walked rather promptly through to the main bridge to be told the Asian Openbill had already left and did not normally come back until late afternoon. We spent most of the morning walking around the reserve slowly. We listened and looked and after almost three weeks in Singapore we were less likely to be tricked into sounds that were not birds! Squirrels, water monitors, lizards, wild boar, macaque monkeys and more had too often stopped us in our tracks when we heard leaves rustling or odd sounds initially! 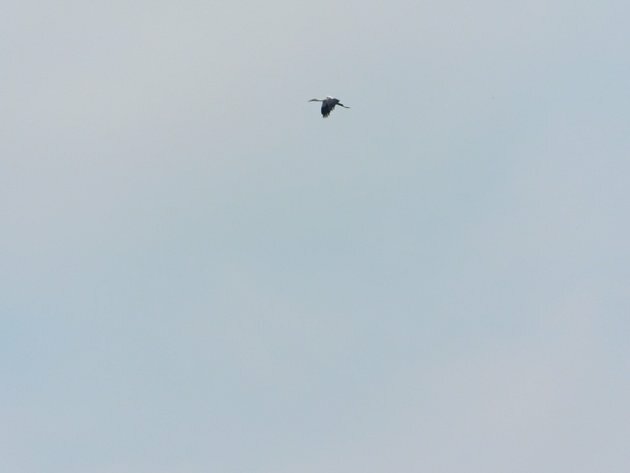 Suddenly across the dull and threatening sky we observed two large birds. 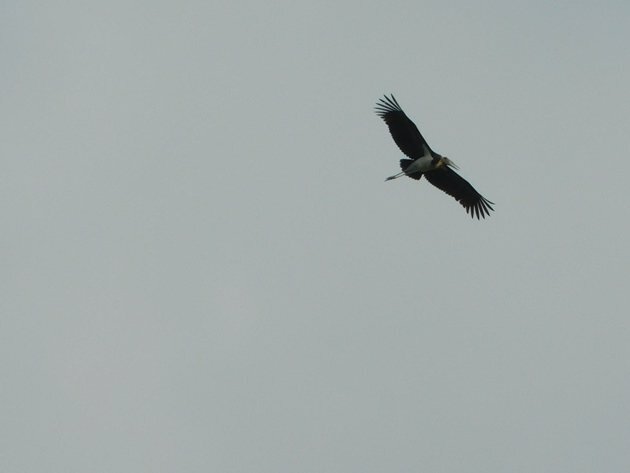 They were not Asian Openbills, but the also rare Lesser Adjutants! The Asian Openbill had been seen with two Lesser Adjutants earlier in the week, but not today! Several photos later and we then had to move to the main hide due to an impending storm. We decided to sit in the main hide throughout the storm and see what happened. We had sandals to change into if it got very wet and we did not want to walk around during thunder and lightning. 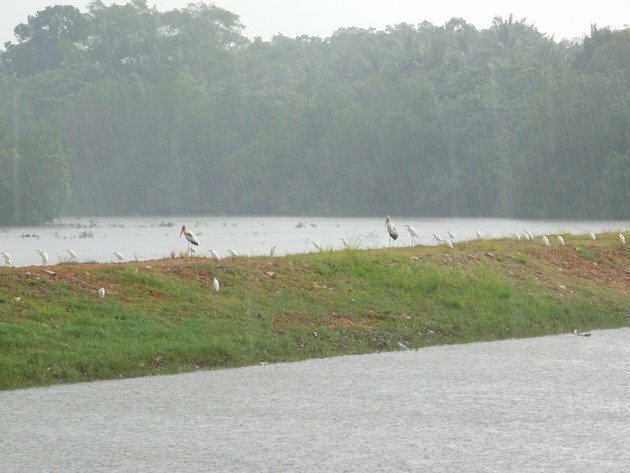 It was actually quite promising as more and more Painted Storks and Milky Storks flew into the ponds and at one point we had twenty of storks huddled together in the rain. We wondered if the Asian Openbill may join the other storks, but it didn’t. I took some photos of the wet storks and egrets anyway in the torrential rain from the main hide! The storm did not bring the Asian Openbill to the ponds on Monday March 25th and so when the rain eased we headed back towards the bus stop. Birds were singing as the rain eased and we were able to observe and add Yellow-bellied Prinia and Zitting Cisticola to our Singapore list. 169 bird species and one day to go! In the evening an article had been written up by the Singhpaore Bird Group about the discovery of the Asian Openbill and they also had to “heavily crop” my photo! We added three more species on our last day, but that’s a whole other story! I have plenty more to share about our three weeks of observing birds in Singapore and photographing birds when I could! We avoided any groups of people with large cameras and tripods, especially when it involved nest sites. Singapore has plenty to offer a bird observer and many different environments and well maintained trails. We would highly recommend travelling to Singapore to go bird watching and you can visit without it costing a small fortune and live quite comfortably! You never know-you may find a rare bird!! The Asian Openbill sounds amazing, but so do all those storks and the Lesser Adjutants.